Disclaimer: Images of horse’s wound within this article may be considered graphic to viewers. Fencing injuries are common and quite scary to horse owners. Equissage client, Jenny was taken aback when she discovered her mare, who is carrying an embryo transfer foal, had received a fairly large wound from the fence. The wound, so large you could literally fit your hand through (as pictured below) was immediately dealt with by vets, followed by a call to her Equissage Consultant to find out how the healing process could be improved with regular Equissage treatments. 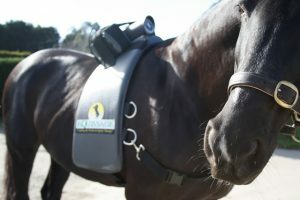 As always, Equissage delivers a high level of client care and provided Jenny with a treatment program to help the injury and location of injury, in addition to her vet’s advice. From Day 1, Jenny was advised by Senior Consultant, Crystal Vanstone, to treat the mare with the hand unit, down the neck and shoulder area as well as over the kidneys plus the use of the leg and tendon boot, on the setting CPM (Cylco Poly Modulation). This setting has a dramatic effect on the lymphatic system and improves nerve-muscle communication stimulating the healing process. Crystal recommended this twice daily. Day 5, Jenny provided Equissage with an update ‘her leg is getting quite big from the knee up and we have bandaged below the knee to stop the swelling’. The mare was treated twice daily with Equissage and the wound was draining really well and constantly dripping. Good news on the healing front! Noting the swelling increase above the knee, Crystal recommended Jenny to increase the intensity of the leg and tendon boot and continue using the CPM setting. Day 9 and the injured mare was still on penicillin and other antibiotics, the smell of infection and the swelling had been kept at a minimum. The vets are very happy with the progress of the healing and the mare continues to receive her Equissage twice a day, Jenny says ‘its made the world of difference’. Having trimmed off the dead skin each week, Jenny’s hoping the skin flap covering the wound will go. At Day 15, an excited Jenny let us know that everything is healing nicely! No more needles and on to the oral antibiotics with daily use of Equissage ‘without fail’ and the vets continue to be happy with the progress of the healing. Day 26, less that 1 month and the wound has started to heal around the edge of the wound and there is no infection. The mare is now off the antibiotics entirely and still reaping the benefits of daily Equissage and looking forward to having her foal! Pictures below from Day 1, 9 and 15.